The misspelling of Leopold Kupelwieser's name already shows that, as far as the attribution of this portrait is concerned, Lebrecht's database is not to be trusted. This picture is not a portrait of Franz Schubert. It is one of two existing portraits of the Austrian physician Karl Joseph Maria von Hartmann (1793-1876). Deutsch, Otto Erich. 1961. "Zum angeblichen Schubert-Bildnis von 1813". In Mitteilungen der Österreichischen Galerie 49. Vienna: Österreichische Galerie Belvedere 1961, 24. Barchetti, Theodor. 1981. "Die Familien v. Hartmann und v. Barchetti. Eigentümer des Hauses Wels, Pfarrgasse 15, im 19. Jahrhundert". In Festschrift Kurt Holter. 23. Jahrbuch des Musealvereines Wels. Wels: Verlag Welsermühl, 247-269. Steblin, Rita. 1992. "Die Atzenbrugger Gästelisten - neu entdeckt". In Schubert durch die Brille 9 (Mitteilungen des Internationalen Schubert Instituts 9). Tutzing: Schneider, 65-80. Steblin, Rita. 1993. "Nochmals die Atzenbrugger Gästelisten". In Schubert durch die Brille 10. Tutzing: Schneider 1993, 35-41. Worgull, Elmar. 1996. "Zwei Fehlzuschreibungen in der Schubert-Ikonographie". In Schubert durch die Brille 16/17. Tutzing: Schneider, 158-171. Worgull, Elmar. 1999. "Kunsthistorische Untersuchungsmethoden als ein interdisziplinärer Aspekt in der Schubert-Ikonographie". In Schubert und seine Freunde. Eva Badura-Skoda (ed. ), Wien-Köln-Weimar: Böhlau, 343-360. Worgull, Elmar. 2001. "Schuberts unbekannter Nachbar in Kupelwiesers Aquarell 'Der Sündenfall'". In Schubert durch die Brille 26. Tutzing: Schneider, 101-108. Lorenz, Michael. 2001. "Erwiderung auf Elmar Worgulls Replik". In Schubert durch die Brille 26. Tutzing: Schneider, 109f. The false Schubert portrait was first published by Otto Erich Deutsch in 1913 as "Angebliches Schubert-Bildnis von Leopold Kupelwieser [?] aus dem Jahre 1813" (supposed Schubert portrait by Leopold Kupelwieser [?] from 1813) in the book Franz Schubert. Sein Leben in Bildern. The basis for the identification of this drawing, which in 1891 was bought at an auction by Prince Johann von Liechtenstein, is an inscription on its back which between 1888 and 1891 was applied by two of Schubert's half-brothers. Its translation reads as follows: "Franz Schubert in the 16th year of his life. Original chalk drawing by the friend of his youth Leopold Kuppelwieser (anno 1813). P. Hermann Schubert mp Curate and preacher at the Schottenstift. Andreas Schubert mp Senior accountant in the I. & R. Ministry of Finance as Franz Schubert's brother". Deutsch was very sceptical concerning the credibility of this testimony. After all, at the time of Schubert's death his half-brothers Eduard (the future Pater Hermann) and Andreas had only been two and five years old. The attribution to Kupelwieser was dubious as well, because Schubert became acquainted with the painter only around 1820. In spite of Deutsch's doubts and the fact that it had never been reliably attributed, the drawing was accepted as Schubert portrait by the general public. 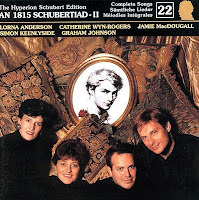 This error was also promoted by several authors of popular books – such as Kurt Pahlen in his Die Große Geschichte der Musik – where the portrait is described as "Porträtskizze[sic] des jugendlichen Franz Schubert von dem Wiener Maler Leopold Kupelwieser". The opinion regarding the supposed Schubert portrait experienced a fundamental change, when in 1996 the German painter and art historian Elmar Worgull in his article "Zwei Fehlzuschreibungen in der Schubert-Ikonographie" pointed out that a man with the face of the supposed "young Schubert" appears on another painting connected with Schubert's circle: on Leopold Kupelwieser's 1821 watercolor "Der Sündenfall" ("The Fall of Man") which shows a game of charades being played by Schubert and his friends in Atzenbrugg, where a man is sitting on the far left at the piano, resting his arm on the instrument and putting his left hand to his chin. Who is this man? In his 1913 book Otto Erich Deutsch, who obviously knew only one sentence of an entry in Franz von Hartmann's family chronicle, made a hasty and uninformed guess. 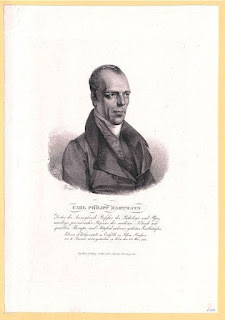 He identified the "Hartmann" at the piano with the only Hartmann, who, according to Deutsch's knowledge, could have been present in 1821 in Atzenbrugg: the German physician Dr. Philipp Karl Hartmann (1773-1830) who was acquainted with Ernst von Feuchtersleben and at some time was involved in the medical treatment of Johann Mayrhofer and Franz von Spaun. The other Hartmann among Schubert's friends, Franz von Hartmann could be ruled out, because he was born in 1808. In his 1964 edition of the Schubert Dokumente Deutsch repeated this misidentification which is a classic example of Deutsch's way of jumping to an unfounded conclusion without a bit of scientific evidence and repeating it as if he were an infallible oracle. The false identification of the man at the piano as Philipp Karl Hartmann in Deutsch's 1913 book Franz Schubert. Sein Leben in Bildern. The name of Kupelwieser's dog was Drago. Den 12. [Dezember 1826] führte uns Pepi Spaun ins Burgtheater, wo wir "Der Erbvertrag" sahen, am 19. ins "Käthchen von Heilbronn" wo das Anschützsche Ehepaar so herrlich spielte. 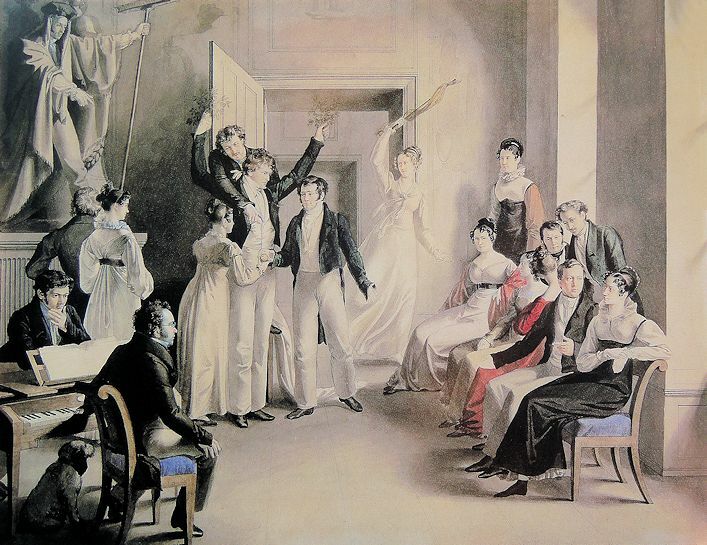 Am 13. besahen wir bei Schober Bilder, darunter ein schönes Aquarell von Kuppelwieser, wo Schubert am Klavier, einige Freunde, darunter Kuppelwieser selbst, dann über das Klavier gelehnt, der Welser v. Hartmann, Professor der Naturgeschichte in Olmütz, welcher später irrsinnig wurde. Als derselbe im Sommer 1825 im Irrsinn aus Olmütz fort gegangen war, kam zu mir in die Wohnung in der Jägerzeile ein Vertrauter der Polizei, und wollte von uns, da wir den gleichen Namen trugen, wissen wohin sich dieser Hartmann gewendet habe. Diese Welser Hartmann stammten aus Bayern, ihr Vater oder Großvater war ein Protomedicus in Linz gewesen u. in der Vorstadt in Wels war das schöne Haus der Familie mit großem von der Stadtmauer eingerahmten Garten, wohin ich während meiner Welser Dienstzeit 1854-1865 oft kam, zu Bar. [on] Pilati u. zum Kreisingenieur Hackher. On December 12th, 1826, Pepi Spaun led us into the Burgtheater where we watched "Der Erbvertrag", on the 19th to "Käthchen von Heilbronn" where the Anschütz couple acted so marvelously. On December 13th, at Schober's, we looked at paintings, among them a beautiful watercolor by Kupelwieser, where Schubert is at the piano, a number of friends, among them Kupelwieser himself, then, leaned over the piano, von Hartmann from Wels, the professor of natural history in Olmütz, who later went insane. After in summer of 1825 this man had left Olmütz in insanity, a police confidant came to my apartment in the Jägerzeile and, because we had the same family name, wanted to know from us, where this Hartmann had gone. These Hartmanns in Wels hailed from Bavaria, their father or grandfather had been a protomedicus in Linz and the family's beautiful house with a garden surrounded by the town wall was located in the suburb in Wels, where during my service in Wels between 1854 and 1865 I went many times, to Baron Pilati and to the county engineer Hackher. In 1981 the judge, amateur historian and genealogist Theodor Barchetti (1931-2006) published an article in the Jahrbuch des Musealvereines Wels, titled "Die Familien v. Hartmann und v. Barchetti. Eigentümer des Hauses Wels, Pfarrgasse 15, im 19. Jahrhundert" ("The Families von Hartmann and von Barchetti. Owners of the House Wels, Pfarrgasse 15 in the 19th Century"). Barchetti, whose ancestors had once owned the house in Wels which Franz von Hartmann refers to in his chronicle, drew up a detailed history of the house and a meticulous genealogy of the von Hartmann family in Wels. Being aware of Kupelwieser's watercolor and the entry in Hartmann's Familienchronik (as published by Deutsch), Barchetti easily identified "the man at the piano" as the physician Karl Joseph Maria von Hartmann (1793-1876). This major achievement was ignored by Schubert scholarship until 1992, when Rita Steblin referred to Barchetti's research in her article "Die Atzenbrugger Gästelisten - neu entdeckt" in Schubert durch die Brille 9. Steblin pointed out Deutsch's misidentification. She noted that the man at the piano cannot be Philipp Karl Hartmann, because not only does he look much too young, he also shows no resemblance to any of Philipp Karl Hartmann's known portraits. In one point Steblin was wrong however, namely when she wrote that "Hartmann died in madness". Hartmann became a taciturn recluse, but the lawsuit he filed in 1870 against his brother's estate proves that he was still in possession of his mental powers. Karl von Hartmann's father Dr. Johann Baptist Hartmann was born on 19 June 1752 in Reichenau an der Knieschna (today Rychnov nad Kněžnou). In 1777 he received his medical doctorate from the University of Vienna and moved to Wels, where he was appointed "landschaftlicher Physikus" (public health officer). On 24 July 1786, in the chapel of Feyregg Castle, Dr. Johann Hartmann married Maria Anna Alterdinger with whom between 1787 and 1805 he would father nine children. On 10 February 1789 Dr. Hartmann bought the house Pfarrgasse 15 in Wels, the building that is referred to as "das schöne Haus" in Franz von Hartmann's Familienchronik. In 1792 Dr. Hartmann made use of the vacancy of the Imperial throne after the death of Leopold II and sucessfully applied for a hereditary knighthood to Charles Theodore, Elector of Bavaria, who until the accession of Francis II ran a profitable business, passing out titles without any serious examination of merits. For a fee of 450 gulden Dr. Johann Hartmann earned the right to call himself "Hartmann Edler von Sternfeld". Karl Joseph Maria von Hartmann – the man whose portrait gained coincidental prominence and was to grace many CD covers – was born on 29 March 1793 in Wels, fifth child of Dr. Johann Baptist von Hartmann. His godfather was his father's best man Anton Schlossgängl von Edlenbach. Since Theodor Barchetti's excellent research on Karl Joseph von Hartmann (in spite of having been "disseminated properly") is still completely unknown, I hereby present a translation of the chapter in Barchetti's article that deals with Karl Joseph von Hartmann's life. Karl Josef María [von Hartmann] is probably the most interesting, but also most tragic figure of the family. Like his brother Anton, he apparently also suffered from a psychopathic disposition which must have been hereditary in the Hartmann family. From 1806 until 1810 he attended the gymnasium at Kremsmünster Abbey, where he lived in the seminary; There he met Franz von Schober who from 1808 until 1812 also was a student in Kremsmünster. When in 1810 Karl von Hartmann began studying medicine at the University of Vienna, he met Schober again, who at that time also lived in Vienna. This acquaintance lead to Karl von Hartmann becoming a member of the circle of "Schubertians" where Schober as one of Franz Schubert's closest friends played an important role. Thus Karl von Hartmann – who by now on 30 August 1817 had received his doctorate of medicine in Vienna – took part in the "Atzenbrugg festivals" of this circle of friends where in July 1821 he was captured in the famous watercolor by Leopold Kupelwieser "Charades in Atzenbrugg" which now is on exhibition at Schubert's birthplace. As a part of a game of charades the Schubertians reenact the Fall of Man. 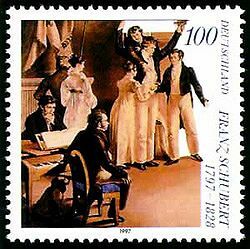 At the left Schubert is sitting at the piano and melodramatically accompanies the scene with his left hand. To his left, at the very edge of the picture, Dr. Karl von Hartmann sits leaning against the piano, the left hand on the chin. It is very likely the only surviving portrait of a member of this family. After receiving his doctorate in 1817 Dr. Karl von Hartmann – he had also trained as an ophthalmologist – worked as assistant at the chair for special natural history at the University of Vienna under Professor von Scherer; in 1818 he had applied unsuccessfully for professorships in Innsbruck and Olomouc and in 1819 in Prague. Finally, on 15 September 1821, by Imperial decree, based on unanimous recommendation by the University of Vienna, he was appointed professor for general natural history and technology at the Lyceum in Olomouc which at that time, however, did not have university status. But already with Imperial decree of 9 December 1824 he was relieved of this teaching position, because "it had become apparent right after the start of the term that he lacked all gifts of communication and the ability of ordinary lecture, because of reticence and seclusion from all company of such a high degree that there is doubt whether he is still in command of his mental powers". The University of Vienna was reprimanded as to why it had proposed Dr. Karl von Hartmann primo loco, although his uncommon shyness, taciturnity and the traces of mental disturbance must have been recognizable. Dr. Karl von Hartmann never recovered from this blow and like his brother Anton he now led the life of an unmarried man of private means. He showed querulative inclinations when he – as Aspernig reports in 1831 – refused to transfer his eighth of his mother's house like his siblings, and did so only shortly before her death on May 1st, 1846; that he was not on good terms with his family in other matters as well, can be seen from his mother's codicil of 10 November 1839, where his inheritance was reduced to the statutory share, if he would not acknowledge the maternal will, not treat his mother and his siblings with the deserved respect or get involved in a legal dispute with the latter. After the death of his brother Ludwig he tried to use a provision in Ludwig's will that after Ludwig's death the known children of his brother Karl should receive the securities from the estate, to achieve a substitution by an entailed estate in his favor. But he lost the case that he had brought to the supreme court in 1870. At first Dr. Karl von Hartmann seems to have returned to Wels. But in 1854 and 1869 he also lived in Steyr in the former Capuchin monastery, outside of the city. He spent his final years at Pochendorf No. 22 near Kremsmünster, where he died on 13 January 1876 of old age. He was buried in the family vault in Wels which in 1887 fell victim to the closing of the old Wels parish cemetery. With him the family became extinct. 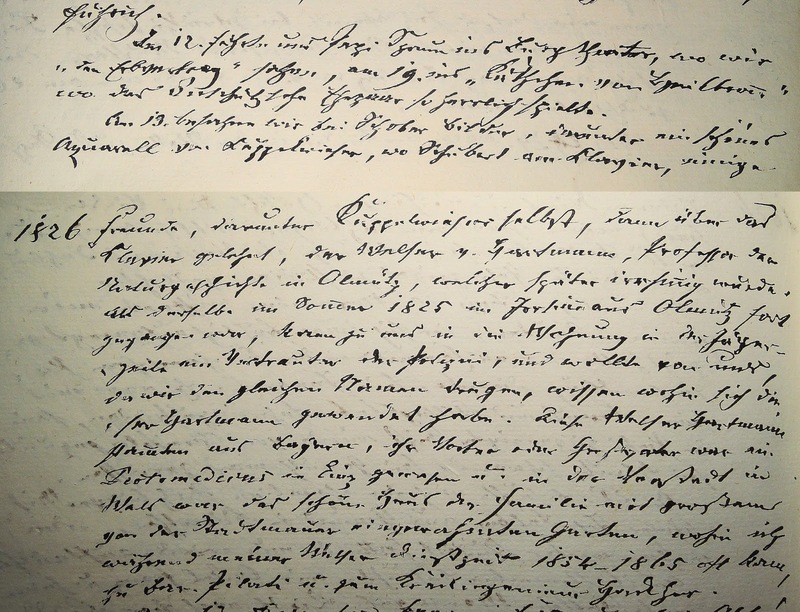 In the death records of the Kremsmünster parish Karl Hartmann Ritter von Sternfeld is listed as having died at the age of 83 in 1876 at Pochendorf 22. But on 25 May 1875 an Antonia Hartmann ("led. [ige] Private") also died at Pochendorf 22 at the age of 67. Was she Karl von Hartmann's housekeeper? The entry concerning Karl von Hartmann's death on 13 January 1876 at Pochendorf 22. The deceased is described as "Dr. der Medizin, pens. kk. Lycenal Proffessor in Olmütz". The given cause of death is marasmus (A-Lla, K23, 306/1876, p. 1). The entry concerning the death of Antonia Hartmann ("led. Private") on 25 May 1875 at Pochendorf 22. (A-Lla, K23, 306/1875, p. 3). 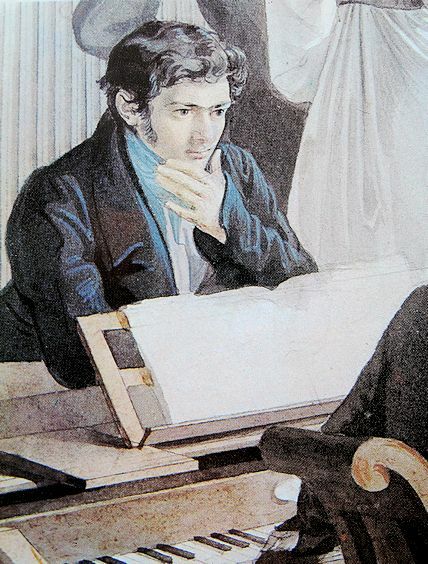 After the publication of Theodor Barchetti's research and its introduction to Schubert scholarship by Steblin, the most important progress that was to be made, was to realize the resemblance between the portrait of Karl Joseph von Hartmann on Kupelwieser's Atzenbrugg watercolor and the face on the supposed "young Schubert in 1813" drawing in the Liechtenstein collection. The merit of having established this pathbreaking connection belongs to Elmar Worgull who, in his 1996 article "Zwei Fehlzuschreibungen in der Schubert-Ikonographie" (Schubert durch die Brille 16/17), dealt with the authenticity of the supposed portrait of "young Schubert". 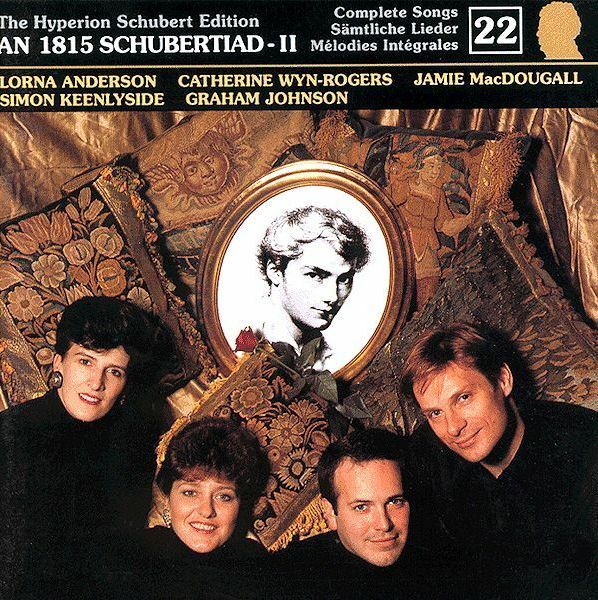 Worgull pointed out the fact that the only person on a painting from Schubert's circle that resembles the supposed portrait of "young Schubert", is the man who is leaning on the piano in Kupelwieser's watercolor of the charades at Atzenbrugg. As a matter of fact the resemblance between these two faces is so strong that it is surprising that it had not been noticed much earlier. Worgull writes: "When the two portraits which are to be compared are reduced to outline drawings, juxtaposed and then projected over each other, the congruences between the two heads are unmistakable, in spite of different drawing techniques and original sizes. To assess them as (almost) identical, will hardly provoke contradiction." Worgull called this method "isoproportional picture analysis". Worgull continues: "Since on Kupelwieser's watercolor Schubert is unquestionably sitting at the piano and the person that is portrayed on the chalk drawing appears beside him, the chalk portrait [i.e. 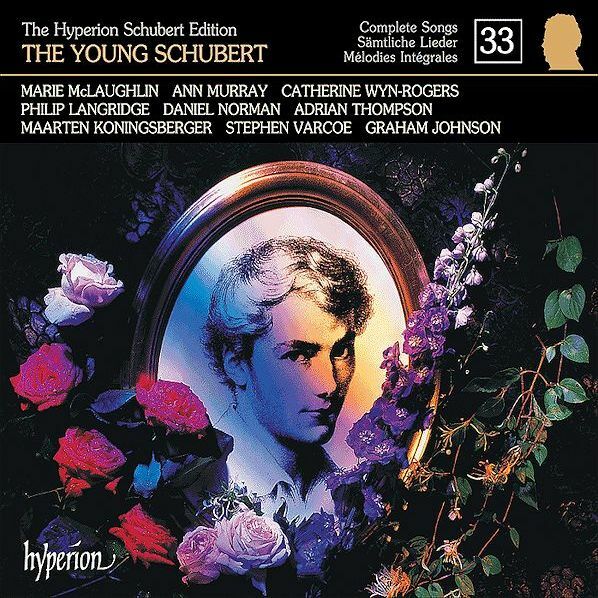 the "young Schubert"] cannot be a portrait of Franz Schubert. Otherwise Schubert would be sitting opposite his own dissimilar portrait." Worgull was able to prove that the supposed "young Schubert" is not a portrait of Schubert. He also presented credible arguments for a redating of this drawing from 1813 to a much later date. As far as the identity of the person on this portrait was concerned, Worgull was unable to expand our knowledge. He could not proceed further in this regard, because he had obviously failed to read Barchetti's 1981 article, where the man at the piano opposite Schubert had been conclusively identified as Dr. Karl Joseph von Hartmann. Therefore Worgull still indulged in random speculations concerning the identity of the man on the Atzenbrugg painting and presented various "Lösungsmöglichkeiten" (possibilities of a solution). He claimed that "a trace leads to Karl-Philipp Hartmann" which is of course a mistaken perspective, because an old error by O. E. Deutsch is not a trace that deserves to be followed. Based on a suggestion from Eva Badura-Skoda Worgull considered it possible that the man at the piano may be the young Moritz von Schwind and included Johann Mayrhofer and even Kupelwieser into the circle of candidates. But of course Kupelwieser can be ruled out, because he is the man in the background who personifies the tree in the ongoing game of charades. 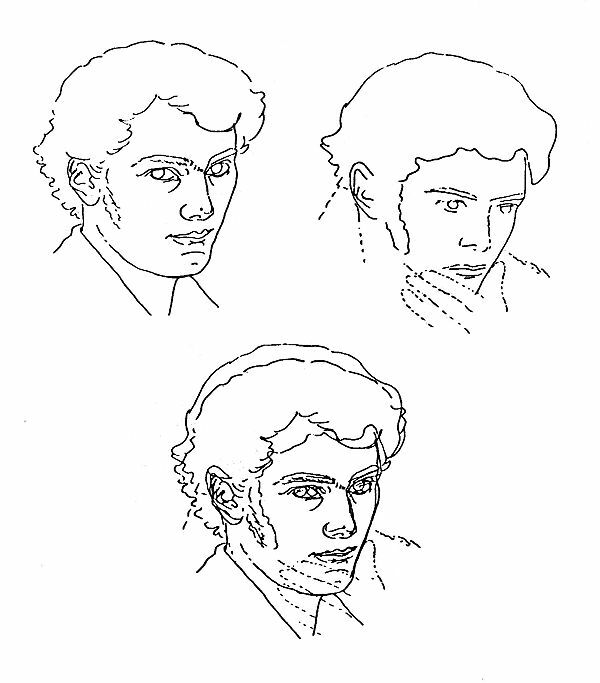 In his 1999 article "Kunsthistorische Untersuchungsmethoden als ein interdisziplinärer Aspekt in der Schubert-Ikonographie" Worgull more or less republished his findings regarding the resemblance between the supposed "young Schubert" and the man at the piano in Atzenbrugg. He also repeated his suggestion concerning the identity of this individual: "We could argue splendidly about the identity of the witness of the well-known Schubertiade which is leaning on the piano. My working hypothesis proposes (among others) Philipp Hartmann." In 2000, in my article "Dokumente zur Biographie Johann Mayrhofers" (Schubert durch die Brille 25) I took issue with Worgull's persistent error and pointed out that "his presumption (based on Deutsch) that the man at the piano on Kupelwieser's 'Fall of Man' is Philipp Hartmann, is wrong." This led to a response from Worgull in Schubert durch die Brille 26. Worgull was unwilling to admit that he had never read Barchetti's article and claimed that "he had been aware of Steblin's research concerning the Atzenbrugg guest lists". 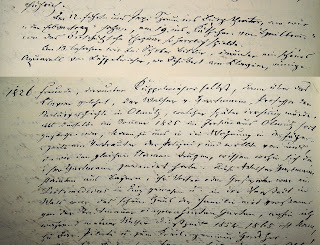 He also retracted his long-standing "Philipp Hartmann working hypothesis" and presented the following tortuous excuse: "I was aware of the fact that the young man beside Schubert cannot be Philipp Karl Hartmann, because his biographical dates are already at odds with this presumption that can be found in the Schubert literature. That in my later text the name [Karl] Philipp Hartmann still appears, instead of for example Karl Josef Maria Hartmann, can be explained by a regrettable oversight of an error that can now be easily corrected. Because my primary concern in 1997 was not to definitely identify Schubert's neighbor on Kupelwiesers group picture, I restricted my published lecture to the aforementioned working hypothesis which included the overlooked careless mistake." In my reply to Worgull's response in Brille 26 I cast doubt on Worgull's excuse and reminded the readers that Worgull had ignored Steblin's and Barchetti's research in three of his earlier publications. I also pointed out that there is absolutely no reason to doubt the testimony of Franz von Hartmann who conclusively identified his namesake, the medical doctor from Wels, on Kupelwieser's painting. 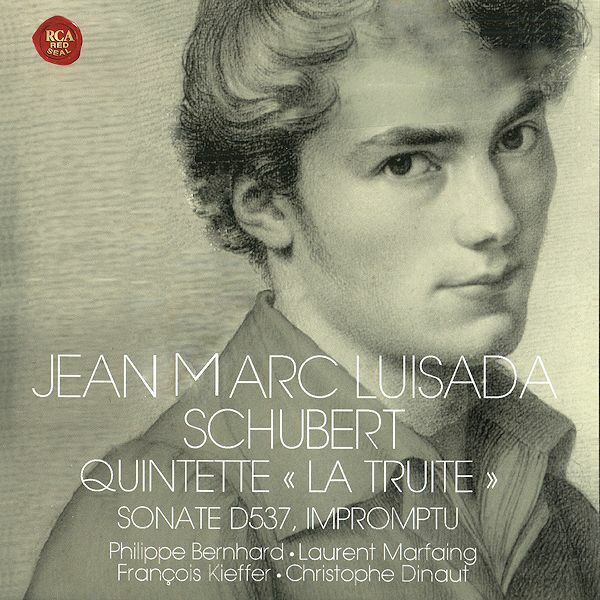 Karl Joseph von Hartmann is the only one of Schubert's friends who made it on CD covers without having written the words to a single Schubert song. Hyperion Records contributed even two releases to (what I chose to call) The Dr. Karl Joseph von Hartmann Memorial Project. 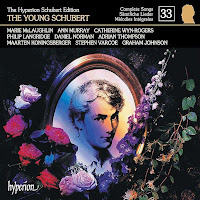 It must be noted that these CDs were issued after Dr. von Hartmann had been identified as the man on the misattributed "young Schubert" portrait. In 1997 Karl Joseph von Hartmann even appeared on a German stamp which was issued on the occasion of Schubert's 200th birthday. The picture I cited in the previous statement can be found on the cover of Sony Classical S2K 58955 (with “explanatory notes” by the performers Tal and Groethuysen in the booklet). I was an editor for that company when this CD was released, but my protests were ignored. Similarly, when the Artis Quartet brought out the Quartets D87, 703, and 804, the “art” department came to me with a picture of Schubert’s “Brille” proudly superimposed upon a Schubert manuscript (SK66720. I pointed out that the manuscript had nothing to do with the works at hand (I think some of it is from the B-flat Sonata) and “did we want to embarrass ourselves with such stupidity”? After all, I had just hired a brilliant woman, Jean Dane, to write the notes, and did we want to compromise the whole thing with evidence of our collective ignorance? The answer, again, was “yes”, we did. Facts don’t matter – salesmanship matters – whether one is a musicologist, editor, pianist, violinist, art editor, or just some moron who has succeeded to power in a company through seedy nocturnal ambition. Yikes. At that point, I started to practice the piano again after 50 years. Excellent article. Many thanks for making it available. I can't imagine how anyone could think this was a portrait of Schubert. It looks nothing like him. Incidentally, you make a very good linguistic point: "When you publish an article in German in the journal of the International Schubert Institute, you might as well not publish anything at all, because 95 percent of Schubert scholars do not understand Schubert's language." Though I'm not a musicologist I hope not to be guilty of this. Because of my love of Schubert I recently began learning German and am eagerly awaiting delivery of Otto Erich Deutsch's edition of Schuberts Briefe und Schriften.